Explore Mount Dandenong in a 1967 Mustang Shelby GT 500, made famous by Gone in Sixty Seconds, come for a cruise with us up and over Mount Dandenong including entry to the famous lookout which on a clear day displays most of Melbourne! Catering for 1 to 3 passengers in our Fastback (as used by Nicholas Cage in Gone in Sixty Seconds!) or up to 4 passengers with our Eleanor Coupe why not book in a 1 hour joyride with us now and get that “movie star” feeling! 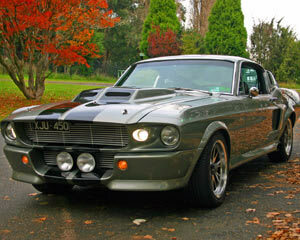 The joyride can cater for 3 or 4 people depending on the Eleanor Mustang that you choose. Fantastic experience. Car was amazing, driver was friendly and informative. Overall, a most enjoyable and satisfying experience. Highly recommend this to others.